Most people know of Amelia Earhart and the records and other aviation accomplishments she made in airplanes. If you are new to gyroplanes you may never have heard of her rotorcraft accomplishments. Gyroplanepassion.com is proud to present a side of Amelia that shows her short falls as an aviator, her tenacity to achieve her goals, and how to never underestimate a woman. I’m not really sure why Amelia’s feat is not given more significant standing in history especially within the gyroplane community. It may be due to all of the actual publicity she got at the time or maybe it has been meant to be a footnote when compared to her mysterious disappearance. Regardless, Amelia’s gyroplane altitude record attempt was as daring and great a feat as anything else she had endeavored to conquer. Picture provided by and all rights reserved by Purdue University. No one can deny that Amelia was a showman (I would be sure she would have preferred the term show woman). Any endeavor she entered upon was made into a grand affair, lots of press, cameras, and movie footage. She certainly wanted her accomplishments recorded for posterity and the picture catalog for Amelia is quite extensive. If she wanted to leave her mark in the pages of history with all this celluloid then I think she met that goal too. It is my belief that Amelia wanted all to know and see that this was a woman that was doing all these daring acts. Many people in life will never accomplish a tenth of what this woman did in a time when women were supposed to stay home. Amelia took life by the horns and set out to accomplish those great aviation records that had been held by men. It can be no wonder that men and women around the world still admire this dynamic personality. Earhart appears to have been not only fearless but also calculating in her actions. A sort of female Roscoe Turner. The first woman as a passenger to cross the Atlantic. The first woman as a pilot to solo the Atlantic. Amelia was the first pilot (woman or man) to fly the Pacific route from Hawaii to mainland United States. This woman from Atchison, Kansas set out to show the world what a woman pilot could do. As her fame grew she developed an almost ultra persona and the press would coin her “Lady Lindy” for her achievements that paralleled those of Charles A. Lindbergh. Like Chuck Yeager in his time, Amelia chased after the demons of the air, for her time. The gyroplane or autogiro was still a big craze at this time in history. An autogiro was a very expensive piece of equipment in 1930 (approx. $15,000.00) and only those people with the financial backing or corporate sponsorship were able to afford one. Cierva, Pitcairn, and Kellet were the leading autogiro or autogyro manufacturers and the future of their product looked very prosperous if the public was made aware of the benefits of the gyroplane. Of course any aircraft manufacturer would love to have an aviation icon in their aircraft and the gyroplane industry was no different. The likes of other aviation pioneers clamored at the chance to fly in a rotary wing aircraft to showcase their flying skills. Amelia found her chance with Pitcairn and entered into the world of rotary wing aviation. From the public perspective this new, odd, flying machine that was able to take off from such a small piece of real estate was truly a great human achievement. The gyroplane of 1930 was cutting edge aviation technology. The autogyro was capable of flying at very controllable slow speeds without the risk of stalling the aircraft and yet was about as fast as any fixed wing aircraft of the time. Many Thanks to T. Chick for providing this awesome video. On December 19, 1930 Amelia Earhart went on a test flight in an autogiro and became the first female autogiro pilot in the world. Pitcairn Field, Pennsylvania, a sod strip. In 1930 three runways running approximately 35/215 -3,400 ft., 130/310 –3,800 ft., 170/350 – 3,000 ft. in an aerodrome style layout. On the west side of the field is a water tower with a rotating beacon and on the east side structures of the Pitcairn Aviation of Pennsylvania Inc. who owned and operated this commercial field of approximately 190 acres. The two wooden hangers offered sales and services of Pitcairn aircraft as well as fuel and repairs. On April 8, 1931 a Pitcairn PCA-2 autogyro sits on the field as a thin woman, Amelia, looks the craft over. It has four large fully articulated rotors of lightweight construction with support cables on the top to keep them from drooping too much when the autogyro was not being flown. Tall and rather large stature landing gear made the ship quite stable even on the grass strip. A sleek rounded structure with short wings with upturned ends. As Earhart completes her checks she surely has to think that this craft is made to make some records. The strikingly featured Earhart wore insulated coveralls and very joyfully and confidently entered the cockpit of the Pitcairn autogyro. Placing her leather flyers cap on her head and adjusting herself on her parachute Amelia starts the engine and her attempt at the autogiro altitude record. Maybe it was for the press, maybe for the crowd, maybe she wanted to ensure the ship had the power she would need, or it may have been she wasn’t fully focused on the task but Amelia fell short on her first attempt at the altitude record. Amelia came back down to make a second attempt. "Women must try to do things as men have tried. When they fail, their failure must be but a challenge to others." Amelia Earhart. Gathering her speed Earhart pulled back on the stick and set the autogyro on its skyward search for the record books. As the altitude increased the air became much thinner which would bring the onset of hypoxia (lack of oxygen to the brain) if she stayed to long at these higher altitudes she could even black out. The April air was cool and at altitude even colder as she watched the altimeter continue to climb. The controls would continue to loose their effectiveness in the thin air and her piloting skills would be challenged as she approached her mark. When no more could be pushed from the aircraft Amelia pushed the stick forward after having attained the incredible altitude of 18,415 feet in a normally aspirated engine in a rotorcraft. Bringing the aircraft in to a nice landing and rolling stop Amelia entered the record books. My many great thanks to Pram73 for providing this video. Following the flight and all the press it was determined that she would attempt a transcontinental flight in an autogyro and establish that record as well. Unfortunately for Amelia there was another pilot with the same ambition that started on the journey before her Mr. John M. Miller in a Pitcairn PCA-2 Autogyro. Earhart had made her departure under the same grand affair as always as Miller had left quietly without any fanfare or grandeur. It is almost ironic that both aviators had airshow stops, publicity stunts and neither knew of the others intentions at the start of their separate quests. Miller did beat Earhart in achieving the first trans-continental flight in an autogyro but Amelia thought she would continue and become the first female to do the attempt. Fortune did not shine on Earhart as a series of incidents lead to the craft being damaged and the attempt being terminated. Amelia returned back east by train. Amelia made many demonstrations with autogiros and in September of 1931 while attending an airshow in Detroit, Michigan she crashes her autogiro on landing. Her newly married husband and publicist George Putnam (married November 8, 1930) described the event, “As I swung around I saw the giro, its rotors splintered, disappear in a cloud of smoke. I vaulted the rail and raced for the wreck. Never have I run so fast, until one of those guy wires caught my pumping legs exactly at the ankles. I did a complete outside loop, up into the air and over, landing full on my back…Coming to my senses, some of them at least, I saw AE emerge from the welter of dust (it wasn’t smoke) and wave her hands in the air to show she was unhurt.” Amelia emerged from the wreckage completely unscathed, her husband cracked three ribs and wasn’t even in the aircraft. Amelia had experienced several hard landing occurrences in autogiros and this experience became her last. John M. Miller continued to tour the United States in his PCA-2 at airshows. He is noted as the first and most famous aviator to loop an autogiro. It should be noted that Mr. Miller was a very accomplished aerobatic pilot prior to ever attempting his loop in the autogiro. Miller accumulated over 2,000 hours in his gyroplane before selling it and described it as a very good aircraft and pleasure to fly. 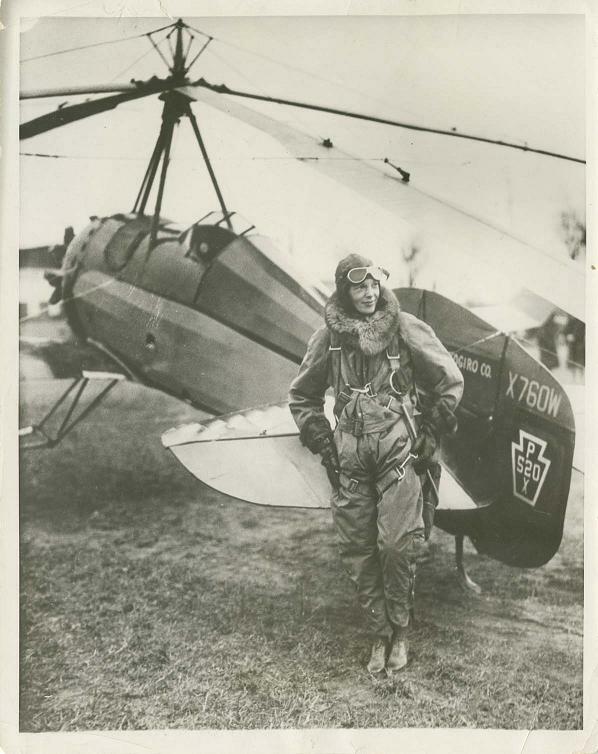 Amelia’s autogiro altitude record only held until September 25, 1932 when Lewis Yancey in another PCA-2 established a new record of 21,500 ft.
Amelia Earhart stood before the public and in all her poise and grandeur showed the world the power of a woman. She took the challenges in early aviation and put her courage to task. Amelia’s autogiro altitude record attempt was no less a feat and the period of 1930-31 may be our best insight into the personal side of Amelia. Her success and failures, marriage, she was appointed the first President of the Ninety-Nines all occurred in this relatively short time span. Amelia went back to airplanes and chased the speed demons and later still the endurance demons once again leading to her ill-fated last flight. Amelia never disappeared she just moved on to another challenge. Gyroplanepassion.com is proud to present a musical journey into the life of aviation’s first lady Amelia Earhart. Take flight in thought and sound as “The Amelia Earhart Project” presents a musical rendition of the life and times of “Lady Lindy”. Set to life in beautiful music is Amelia, as you have never experienced her before. My Many Thanks to Pram73, and T. Chick for keeping a Legend alive. Thanks to the Purdue University and the George Putnam Archive for the use of the Amelia Earhart picture with the Pitcairn autogyro. All rights belong to the Purdue University and the George Putnam Archive.